Thomco-online is a wholly owned subsiduary of Thompson Cooper Ltd. Established in 1973. We have established ourselves as a leading wholesale supplier of catering and janitorial materials who really understand your needs. The quality of service we provide is key to the success of our business and we strive to maintain this business ethic through our online service. 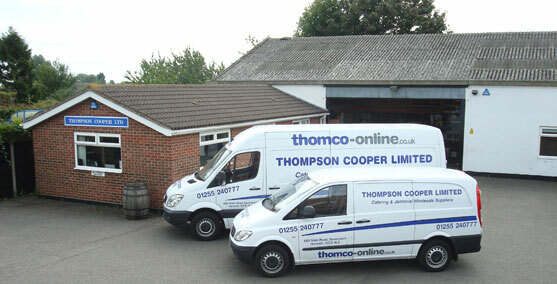 Thompson Cooper Ltd was established by Jack and Gwladys Cooper in 1973 as catering and janitorial suppliers in north east essex. Soon being joined by their children Margaret and John based at Durite works valley road for 22 years before relocating to their own purpose built premises on Main Road Dovercourt in june 1996 Presently holding in excess of two thousand stock lines. Our own van's cover Clacton,Colchester, Mersea Island, Braintree, Stowmarket and Snape with twice weekly deliveries. we at Thompson Cooper Ltd have strived to offer a reliable and friendly service.